Specifying roof tiles for new build and renovation projects can be a juggling act. The need to create buildings that blend with their surroundings and are more environmentally friendly can often increase cost.Housebuilders and homeowners have become more discerning in their choice of roofing materials in recent years, and the quality of exterior finishes is being used to differentiate new homes. 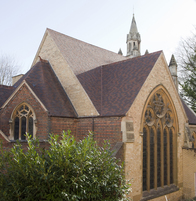 In many parts of the country, clay plain tiles are specified by planners and conservation officers to preserve the character of buildings and architecture because they are a durable, natural, sustainable product that improves with age and weathering. A clay roof can distinguish a house as a premium or heritage property and this means that for many builders and roofers, clay is synonymous with high cost. However, this isn’t necessarily the case anymore. Machine made clay tiles are the most affordable option - on average, a single camber clay plain tile costs just 10% more than the concrete equivalent but provides a more attractive finish. As clay manufacturing processes become more efficient, the difference in cost between clay and concrete plain tiles continues to shrink. As clay tiles become more affordable, more roofs being replaced by clay rather than concrete, preserving the quality and aesthetics of older buildings. This means that our Acme Single Camber and Hawkins plain tiles are usually affordable for most projects. These single curved tiles are perfect for when you want to achieve a premium clay roof without breaking the bank. They can be used at a low minimum pitch of 30 degrees, giving flexibility in design. Double camber or handcrafted tiles have a more authentic appearance than a machine-made tile but are more affordable than a fully handmade tile. Double camber tiles curve from top to bottom (like single camber tiles), and also from left to right, adding another dimension to the roof. Our Acme Double Camber clay plain tiles are the only ones manufactured in the UK and this unique double curve gives you the opportunity to create highly textured roofscapes with accentuated light and shade. Handcrafted tiles have a more highly textured, heritage or weathered appearance than machine-made tiles and are lower in price than fully handmade tiles. They are machine made until just before the tiles are fired, and then hand finished to give a rustic appearance. These, such as our Ashdowne handcrafted tiles or Hawkins plain tiles in Fired Sienna, have a granular texture that provide slight random irregularities. The process gives each tile a unique character similar to that of aged, weathered tiles. Handmade tiles provide the most authentic appearance, and are used in instances where looks are more important than budget. These can include high end applications or where planning dictates that a genuine handmade product must be used, such as in conservation areas or renovation projects. An increasing need for authentic handmade clay plain tiles saw reclaimed clay roof tiles becoming sought after as specifiers seek to give new properties instant character. To meet this need, we introduced the Canterbury handmade tiles range. Handmade by skilled craftsmen, using traditional methods, each Canterbury tile is unique and is available in three colours to create truly individual roofs. Although it is our most expensive clay plain tile, many people find that it is surprisingly affordable for premium projects. Don’t think that clay is out of your price range, as product innovation means that there is a huge variety of clay plain tile types and colours available to suit every project and every budget. Adding clay roofs to your portfolio of services not only allows you to compete for a wider range of projects, but could also enable you to add value to sales by being able to offer a premium roof finish, in some cases for only a small uplift in materials cost.